By virtue of their trade with the Redskins, the Rams will now have a total of five first-round picks to work with over the next three drafts. If Sam Bradford actually delivers on the promise he showed as a rookie, the Rams will be able to surround him with a lot of young talent on both sides of the ball. They’re only the fourth team in the past 10 years to have that many first-round picks to work with over a three-year stretch, and those teams have each used their haul of young talent to make it back to the playoffs. Of course, the Rams need to draft well to deliver on that possibility, something they haven’t done over the past few seasons. That fact, actually, directly leads to this haul; if they hadn’t landed on busts like Adam Carriker and Jason Smith in the first round in previous seasons, they wouldn’t have been bad enough to end up with the second overall pick. The Rams do have building blocks in Bradford and criminally underrated pass-rusher Chris Long, and with the sixth overall selection, they should have a shot at the likes of Oklahoma State wideout Justin Blackmon or cornerback Morris Claiborne. Even if RG3 ends up being a massive success in Washington, the Rams should be able to look back and smile at this trade. Weinreb: Mr. Griffin III Goes to Washington? Writers of mock drafts around the globe will no longer have to write huge disclaimers in their articles before pretending that the Rams are going to hold on to the no. 2 pick and draft somebody. This is a victory for all of us. With an RG3 deal off the table, the Dolphins’ search for a starting quarterback gets a little more desperate. A week ago, they had three options to pick from, and now they’re left with Manning and Matt Flynn, each of whom has warts. Although that may not sound like an enormous difference, the RG3 trade eliminates a good amount of Miami’s leverage and leaves them one signing away from having no leverage at all. Let’s say that the rumors about Peyton Manning wanting to sign a contract before free agency begins are true. We detailed why that’s a good idea for him last week. If Manning wants $20 million in guaranteed money and isn’t willing to work out for a team before doing so, don’t the Dolphins have to say yes? If they say no and somebody else agrees to Manning’s terms, then they enter free agency with Matt Flynn as the most notable quarterback on the market. That will push Flynn’s price tag up dramatically, and he might be able to get $20 million guaranteed from the teams who weren’t able to land Griffin or Peyton. So if you’re the Dolphins, would you rather give Manning $20 million in guaranteed money or push that toward Flynn? The fact that this trade happened on March 9 as opposed to April 9 is probably going to cost the Dolphins a lot of money. The Cardinals and Seahawks aren’t quite as disappointed as the Dolphins are because they were less likely to put together a viable package for RG3, but they’re still going to feel the effects of a more furious market for the two veteran quarterbacks. These teams also seem more interested in Manning than in Flynn, and since the Redskins only made the RG3 trade once Manning reportedly told them that he wasn’t interested in heading to Washington, it doesn’t really eliminate a contender for the guy they truly want. Here’s the real wild card lurking in the shadows. Has the starting quarterback of a team who was that close to making the Super Bowl ever hit unrestricted free agency quieter than Alex Smith is about to? And would a team looking for a veteran quarterback make a run at Smith if they end up missing out on Manning and Flynn? You’ll note that the Cardinals and Seahawks play in the same division as the 49ers, and signing Smith would consign the Niners to starting Colin Kaepernick, he of the five professional passes, at quarterback. Alternately, what if the Dolphins miss out on RG3 and Manning and think that neither Flynn nor Smith are worth the money? That could lead them to another choice: Texas A&M quarterback Ryan Tannehill, who will still be on the board for the Dolphins with the eighth overall pick in the draft. The Dolphins’ second-most pressing concern, arguably, is the absence of anything resembling a second pass-rusher behind Cameron Wake. The team is transitioning from a 3-4 to a 4-3 this offseason, which will move Wake to defensive end, but could the Dolphins decide to fill the hole across from Wake by taking Mario Williams away from Houston? A Wake-Williams one-two punch would be the best pair of pass-rushers in football, and while they would be taking a risk with Tannehill at quarterback, Matt Moore would be a competent backup if Tannehill weren’t ready. And, after all, the Dolphins will be taking a risk no matter who they acquire to play quarterback. Everyone knows a couple who had a rocky moment after a couple of years of dating — a quick affair, a breakup or a mere “break,” a huge fight that caused them to move out of the apartment they shared — only for the couple to respond to the rocky moment by getting engaged and then married. The Jets and Mark Sanchez just had that happen to them this past week. Gang Green spent most of last week eyeing Peyton Manning lustily, but once Manning made it clear that he wasn’t going to be heading to New York, the Jets apologized to their shirked quarterback by giving him a three-year, $40.5 million extension on his rookie contract, which still had two years left to run. The deal guarantees Sanchez $20.5 million over the next two seasons while freeing up $6.4 million in cap space for the Jets as they head into free agency. It’s fun to imagine the Jets dropping $20.5 million on Sanchez’s head to prevent him from changing his relationship status on Facebook to single, but the commitment the Jets are making to their quarterback isn’t quite as dramatic as it might seem. As Jenny Vrentas of the Newark Star-Ledger notes, abandoning their pursuit of Manning basically confirmed that the Jets would head into 2012 with Sanchez as their starting quarterback. Sanchez had no guaranteed money left on his rookie deal, but was due $17.75 million over the next two years if the Jets kept him on the active roster. This contract extension turns that figure into guaranteed money and adds $2.75 million in guaranteed cash to the deal, basically assuring that Sanchez will be the team’s quarterback for the next two seasons. The Jets can cut Sanchez after the 2013 season without any financial penalty. So essentially, the only difference between Sanchez’s old deal and his new one is that the Jets are stuck with him for 2013 and have the option to retain him for three years afterward on their own terms. That’s not so bad, especially considering their cap savings in 2011. Last month, we suggested that the Broncos could go after RG3 as a replacement for Tebowmania in Denver; instead, Denver upped its sights and surprisingly has gone after Peyton Manning, who spent six hours meeting with the Broncos on Friday before staying there overnight. (No word yet on which base the Broncos may or may not have gotten to.) While we thought that RG3 might provide the Broncos a chance to sell high on Tim Tebow without alienating their fan base, Manning would represent an even better opportunity to do that without having to give up any draft picks in the process. The Broncos undoubtedly see Manning as their ticket to stay in the playoffs, a feat they might struggle to pull off with Tebow in the lineup. Remember that the 8-8 Broncos were 7-4 in games decided by a touchdown or less last year and had the point differential of a bad 6-10 team, so they’re likely to decline in 2012 if they don’t make any changes. A healthy Manning would obviously arrest that drop and give the Broncos a chance to claim consecutive AFC West titles. If that move were to happen, of course, Tim Tebow would likely be on the trading block. (The world is not ready for a Manning vs. Tebow quarterback battle.) Among those interested would undoubtedly be the Jacksonville Jaguars, who we theorized might deal the seventh overall pick to Denver as part of a three-way trade to get RG3 to the Broncos. They wouldn’t deal the seventh pick to Denver straight-up in a Tebow deal, but the 39th selection would undoubtedly be in play and the Broncos could even try to get Blaine Gabbert as part of a trade to learn under Manning. It would be selling very low on Gabbert, but Tebow would create a level of excitement in Jacksonville not seen since the Mark Brunell/Fred Taylor days. to give up a first-round pick and take a shot at Mike Wallace. If we understand the rules right, a successful bid on Wallace would force the Browns to give up their selection — the fourth overall pick — and not the 22nd overall pick they received from the Falcons as part of the Julio Jones trade last year. Even with that in mind, such a move might be worth it. The Browns are reportedly considering Blackmon with the fourth pick, but wouldn’t you rather have Wallace than Blackmon? Wallace will demand a higher salary and more money up front, but he’s just 25 and has 3,000-plus yards of pro production. The Browns would also be taking away a star from their divisional rivals. If the Steelers match the offer, then the Browns have taken away all of Pittsburgh’s cap space and can just go ahead and draft Blackmon (or whoever else they want) at no. 4. If the Browns successfully pry Wallace out of Pittsburgh, then the Steelers would have the no. 4 pick and would be able to grab Blackmon, Claiborne, or USC left tackle Matt Kalil. They could also alternately trade down and grab multiple later picks, which wouldn’t be the worst thing in the world for an organization that drafts and develops talent as well as the Steelers do. 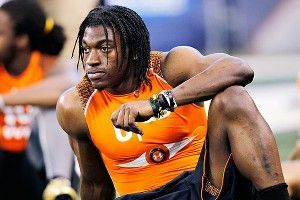 Mr. Griffin III Goes to Washington?